We take a look at the fast playing, empire building board game Eight Minute Empire. Does this game truly play in only eight minutes? 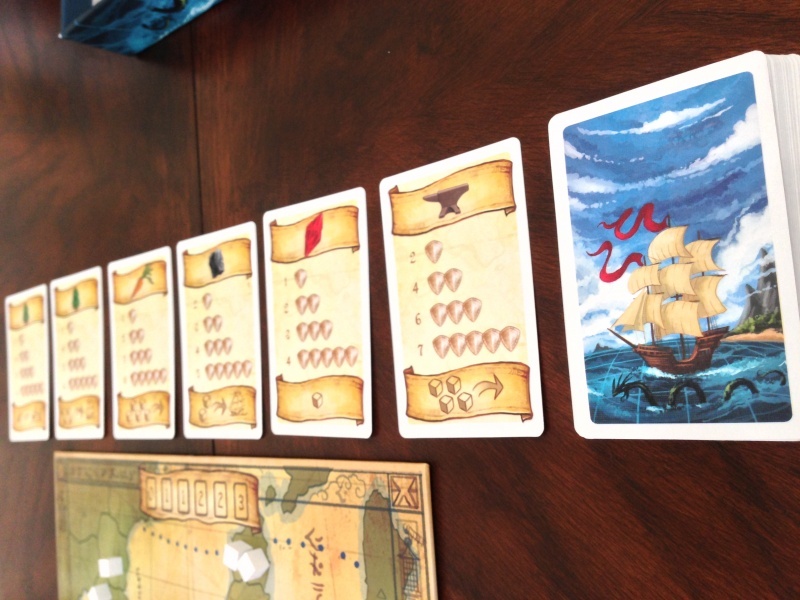 Read our full board game review to find out. I love empire building games. Taking your tiny starting civilization from its meager beginnings to a an empire that stretches across the known world is a thrilling concept. If you want to to create an empire, there are many choices out there already: Civilization, Through the Ages. The problem with most of those is you have to earmark a few hours at the very least to get through the game. Well, no longer. Eight Minute Empire seeks to let you conquer the known world a whole lot quicker. Can you really create an empire and conquer the world in just eight minutes? Read of to find out! Eight Minute Empire is a area control and set collection game for 2-5 players. Eight Minute Empire plays best with any number of players. The closer to the draw stack, the more expensive the card will be to acquire. 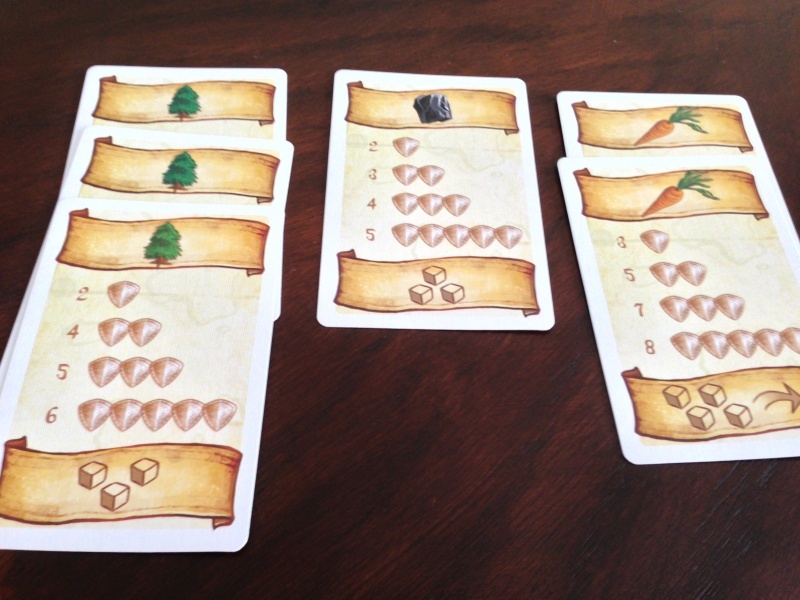 The game play in Eight Minute Empire is brilliantly simple. It has to be to claim an eight-minute playing time. The goal of the game is to spread your troops out from the starting region and to control as much of the world as possible. 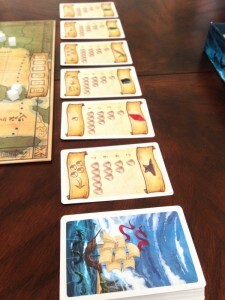 The game will play over a set number of rounds and each turn, a player must draft a card from six available. Then he takes the listed action on the card. The actions range from moving troops to adding more troops to founding cities. The card a player drafts will also contain one of five resources that will give a player victory points at the end of the game. After the specified number of rounds, the player with the most victory points wins (based on areas controlled and sets collected). There aren’t many components in this small box, but what is in there works really well. 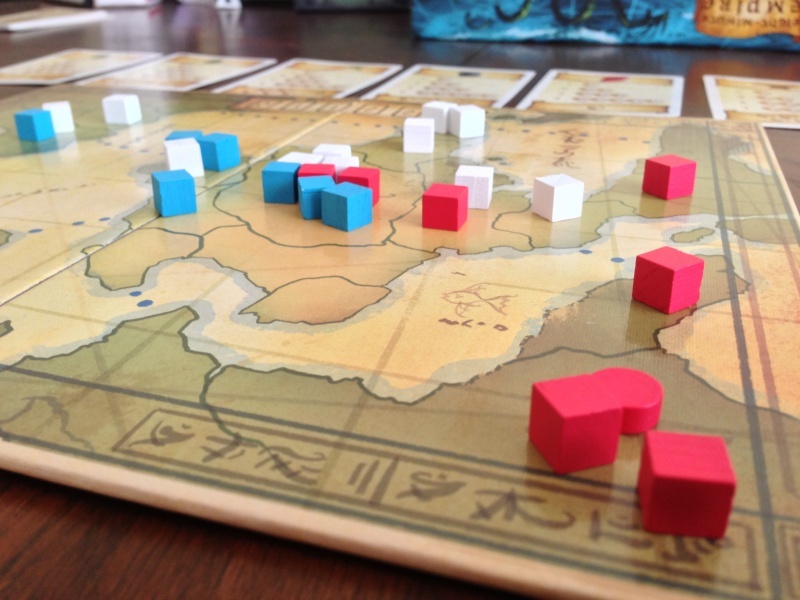 Eight Minute Empire comes with a dual-sided game board to give players two map options. 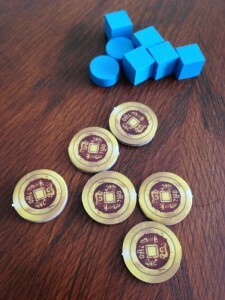 Each player has a set of wooden army cubes and city discs. While it would have been cooler for the troops to be miniatures instead of wooden cubes, it doesn’t diminish the enjoyment of the game any. Also included is a deck of cards for player actions and set collection during the game. Finally a number of cardboard tokens are included. Everything fits well inside the small box. I also want to point out that the artwork on the cover is fantastic: beautiful, vibrant watercolor-like vistas. I wish there was more of it throughout the game. 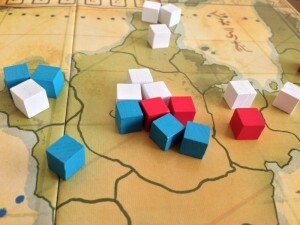 In addition to area control, players must try to acquire sets of resources. The more they have, the more victory points they will earn. Once players have chosen on which map to play, each player takes 14 army cubes, 3 city discs and a number of coins based on the amount of players. The deck of action cards is placed at the top of the map and six cards are dealt face up along the top of the board. Players will then bid on who goes first (with most people bidding zero, I’ve found). 1. Draft an action card. There are always six cards for a player to choose from. A player can take the left-most card for free or they can pay a specified amount of gold to take one of the other available cards. The cost is 0,1,1,2,2,and 3 coins respectively, based on the location of the card. So if you really want that new card that just got drawn on the right, it’s going to cost you three of your limited amount of coins. 2. Take the action on your card (optional). These actions will range from adding more troops to the board, moving troops around the board, or founding a city. When you place troops on the board, they have to be placed into either the start region or a region containing one of your cities. After a player has taken his action, the cards at the top of the board are slid to the left to fill the space vacated by the chosen card A new card is drawn and placed on the right of the current cards. Then the next player takes their turn. I should mention that each of the action cards also has one of 5 resource symbols on it. The more of a certain resources a player has, the more victory points that set is worth at the end of the game. So players are not only just trying to control areas on the board, they are also trying to collect sets of the five resources. The game ends after a set number of rounds (based on the number of players). At the end, players will total up their victory points, based on how many territories a he controls and how much his sets of resource cards are worth. The player with the most points is the winner. Players must try to control as much of the board as possible with their limited amount of troops and actions. So does Eight Minute Empire really take eight minutes to play? Actually yes, you can play a full game in eight minutes. Does that make it a weak, filler game? Hell no! I actually really like Eight Minute Empire and part of that love comes from its simplicity. I like that I can explain the rules to Eight Minute Empire in a short period of time. The game just makes sense. Choose a card, take an action, collect a set. Area control is also such an easy concept to understand (it’s been in gaming since I was playing Risk as a child), that most people shouldn’t have any problems picking up the rules. This means that you can break out Eight Minute Empire with just about anyone: gamer or non-gamer. To go with that simplicity is Eight Minute Empire’s truly quick play time. I was dubious that I could actually get in a game in eight minutes. It is possible: we timed it, but it requires everyone to be focused. This is especially true when you add more players. Once you get into the 4-5 player range, it’s probably more like 15-20 Minute Empire. But that’s okay. That’s still a really quick play time for a game that boasts a good amount of strategy and interaction. Each player will have a limited amount of coins during the game. Spend these wisely or pay the consequences. So yes, Eight Minute Empire is a lot deeper of a game then you standard filler game (Skyline, Martian Dice, No Thanks! ), but it’s not going to be the main attraction for your game night. With the title boasting an eight minute game play, that shouldn’t come as a surprise to anyone. Yet it’s also one of the more strategic filler games you will find and is still a fantastic game with some hard decisions that have to be made. In those quick eight minutes, you will have many hard decisions to make. First, you only get about 7-13 total turns (based on the amount of players) so each card you choose on your turn will be extremely important. Do you take the card that lets you move a troop across the ocean or do you grab that third gem resource card for the extra victory points? And then there is your limited stock of coins. You will have one more coin than the number of rounds in the game, so you have to spend them wisely. One or two turns of choosing the expensive 2-3 coin cards will quickly drain your bank account. Grabbing that useful card early in the game for two coins will mean that in the later turns, you might be forced into taking the free, useless card. The hardest part of the game will probably be dealing with the luck of the draw deck. There will be times when you really, really want to build a city but none will show up in the available cards. At that point you just have to complain to your fellow players and take the best card you can use. The luck is mitigated some by the fact that there are always six cards to choose from, but lady luck is a fickle mistress and she will rear her fickle head during this game. But to be honest, the luck of draw isn’t really that bad of an issue during the game, but there will be times you will be cursing Eight Minute Empire because of it. While there won’t be any dice rolling when you compete for territories, there will still be plenty of competition. There is also surprisingly little conflict during the game. When I first got it, I was expecting to battle other players for control of territories. While you will still fight other players for control, there is no attacking. It’s all about having the most troops in the region. And since your turns and armies are limited, once again it can make for some hard choices to either let that region go or commit more troops. With only 14 troops available during the game, do you really want to commit 3 of them to one region to beat your opponent for it? This can make for some fun and scary games of chicken during the game. Speaking of limited turns, that’s probably my biggest gripe with Eight Minute Empire (if I have one). The game goes by too quickly! Just as my armies are getting spread out and I have a new city founded, the game is over. I always feel like I needed another turn or two to really get my empire rolling. It’s funny that I love the game because it plays so quickly, but I wish it played on longer when I’m near the end of the game. Oh Eight Minute Empire, why must you torture me! Finally, I want to point out the great balancing that Eight Minute Empire does with its victory points. It would have been easy to just make the game all about area control. But the set collection aspect takes the game to another level. As mentioned earlier, you aren’t just choosing cards based on the actions they hold, but the resources as well. This adds another layer of decision making and complexity. You might only control five territories, but if you have the right cards, you can still be in the running to win. This helps keep a tight race to the very end. 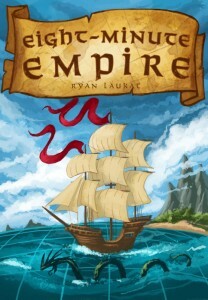 I really like Eight Minute Empire much more than I expected too. For such a simple game, I was expecting a quick filler that didn’t require a whole lot of thought. That’s usually the case with many of filler games I find. Not so with Eight Minute Empire; each game is tactical, interactive, and a whole ton of fun. I love spreading those little cubes across the map and stealing territories out from under my opponent’s nose. While the components or the depth of game play isn’t going to blow anyone away, I think you still end up with a fantastic game that you can pull out with both your gamer and non-gamer friends alike. 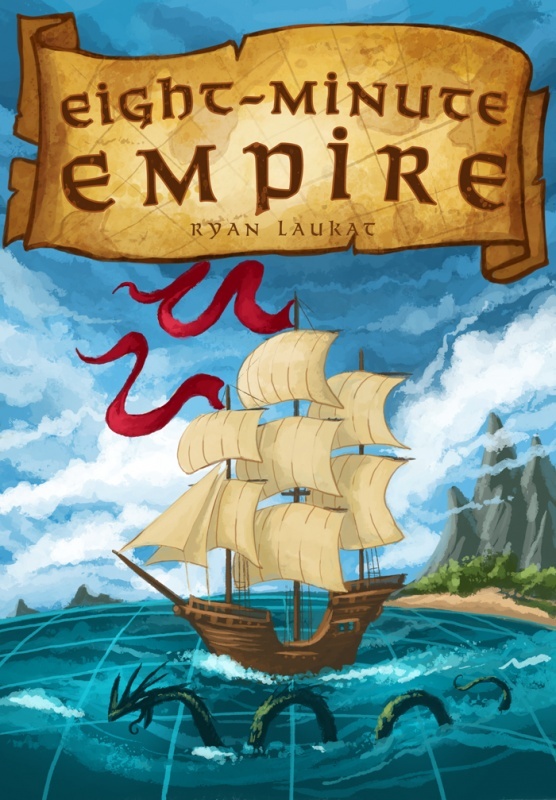 If you are looking for something that’s a step about your average filler game, then Eight Minute Empire is a great game to open up your game night with. It’s not often a game can play in under ten minutes that so easily capture my attention. I’ve found that much like Lays Potato chips, I can’t stop at one. We almost always play 2-3 games in succession. Because it ends so quickly, Eight Minute Empire has a really funny “just one more game” aspect to it. Any game that can do that to you deserves a place in your game library. Pick up a copy today, it’s worth it. 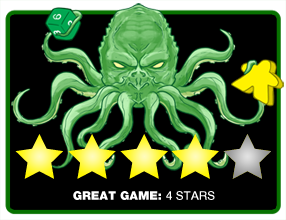 Final Score: 4 Stars – A strategic area control game that plays incredibly quickly. Don’t be surprised if you want to play this one again and again. Good review. I agree with pretty much everything you’ve said. Every person I’ve introduced to the game has really enjoyed it. I’m constantly surprised by the amount of strategy and tough decisions that such a small game has to offer.